Is there a particular area of the island that is much more likely to spot moose? The best places and times are dawn and dusk around water with weeds growing (aka food). 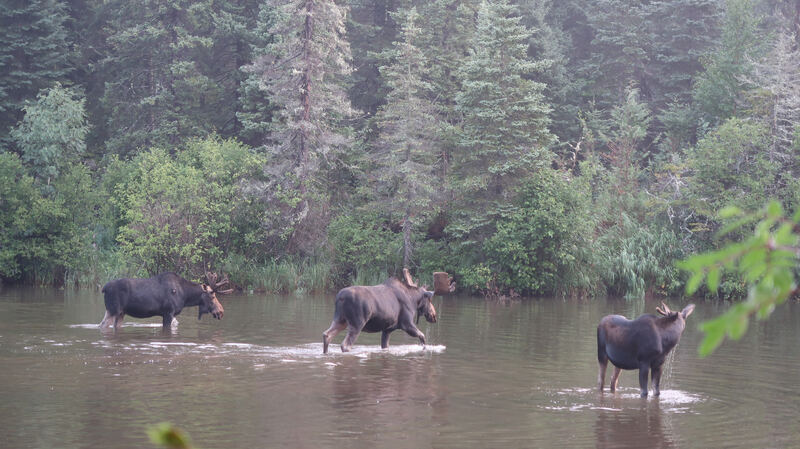 Moose tend to move towards the cooler areas and chill out during the day. I have found it is more about being quiet and observant, they are all over the place. Washington Harbor/Windigo CG seems to be a regular place to see moose feeding either in the creek or the mouth of the creek where it empties into Washington Harbor. Thanks guys. I’ll be on the lookout!! Last year we were hard pressed to see one in 6 days. This year we saw a TON in 10days. The difference is we woke up earlier (6:00am) and hiked further away from crowds (aka daisy). The most we saw were in Windigo area. Between midnight and sun up at Washington Creek, when you have a clear evening with a full moon or lots of stars. A bull was following a cow up and down the Creek after Labor Day (2016) each evening. I was in a shelter for 4 evenings. The bull walked through my/our camp site every night on its way to the Creek.